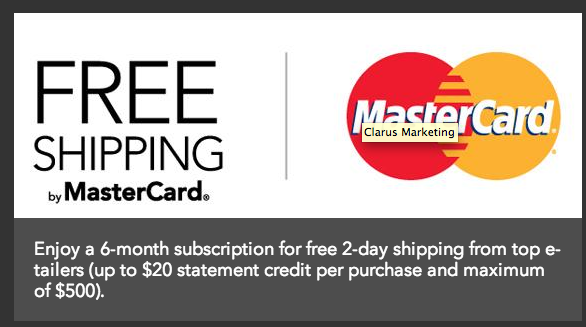 Mastercard is offering free 2 day shipping to select retailers from now to the End of May. Free 2 day shipping is from BestBuy.com, QVC.com, Macys.com, Kohl.com and Walmart.com. You can pay $69 for the year and extend the free shipping to Nordstrom, Target, Gap, Sephora and Shutterfly. Offer not valid Iowa. Sorry guys. 2) Click on the Store you want to shop at and choose 2 day shipping. You have to pay for the entire purchase with your Mastercard, no gift cards. 3) Email your confirmation to Rebates@FreeShippingbyMasterCard.com and you will get your credits. Thank you AS for the tip! Please note: I couldn't find anything about having to pay after 6 months. Either you just lose your subscription or you will automatically be enrolled in paying for it. Be aware of that so be on top of canceling right before the 6 months are up. You can also get a 1 year subscription to ShopRunner from American Express for Free.